It has come to my attention Centurion Gaius Maximius Pintus, while away in Rome on my orders to train replacements you provided before they join us on the Eastern front, wrote a letter directly to the senate which has created a stir among Rome’s military elites and has even reached His Majesty Emperor Romulus Augustus himself. My understanding is Centurion Pintus brought to light Generalis Flavius Ricimer and staff having continually forced us to lower our training standards in order to ensure substandard, non-Roman conscripts enter service and fight as members of the 11th Legion. All to meet some delusional belief these substandard, non-Roman Legionnaires can somehow be seamlessly integrated into the Legion, making it stronger, which will miraculously turn the tide in this 100-year decline of the Empire. In the 16 years of combat during which I have led the 11th in battles occurring in every corner of the Empire, this is not the first social or political agenda to come out of Rome’s coddled elites, and non-combat experienced, political and supposedly erudite military commanders, not the first time we have been forced to accept a self-destructive command. These ludicrous commands have seen the irreversible decimation of Rome’s legions, loss of credibility and respect, and the loss of 1/3rd of the Empire’s territory in the last 15 years alone. I understand we are all, at every level, from the Legionnaire in combat to you and the members of your command, exhausted from this endless war to at best slow the decline of the empire. None of us are making the best decisions. However, with war raging on every front, as our Legions are steadily exhausted and depleted, as the empire loses territory after territory, do you really believe this is the time to double down on social agendas and politics? There is a dangerous insanity perniciously gripping Rome’s elites, sadly including her military commanders, a belief Rome is indominable, that her weakened Legions will turn the tide and sustain her forever, that her enemies cannot sack her yet again, this time perhaps to her final ruin. This was true only when Rome’s Legions were composed mostly of the sons of Rome, when Romans fought for their Empire rather than hiring or conscripting others to fight for them, so they may live lives of comfort, politics and social agendas far from the realities and hardships of war. The 11th has stood in defense of Rome since before the Empire existed, since the two legions of the Legio Undecima Claudia were first stood up by Gaius Julius Caesar himself. The 11th has stood alone out in the frontier against Rome’s many enemies even in the times Rome herself has been sacked and there was very real doubt the Empire was still in existence. But I fear in my own lifetime the 11th will finally be forced to surrender its Standard to oblivion. And as goes the 11th, so finally goes the Roman Empire. The truth is, your legions are utterly spent. Lowering the standards to expand the pool of those available to serve in Rome’s many battles will not reverse this fact and will only accelerate depletion of the ranks. You in Rome have pursued political agendas and the agglomeration of fame, wealth and power unto yourselves, living in a delusional bubble made possible by those fighting a very real and losing war. Meanwhile, 16 years with no break in fighting has killed many of our greatest warriors and leaders, has exhausted the ranks, destroyed untold numbers of families, and has broken the minds and spirits of many of our strongest. 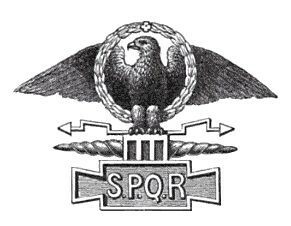 Make no mistake about it, there is a deep hatred for Rome rising in the ranks, even among those few of her sons who choose to serve her in combat. Centurion Pintus letter is but only the smallest example of this rage, of the growing loss of faith in leadership, and even in the future of the Empire. Do not destroy Pintus, as my associates in Rome assure me you are seeking to do, return my Centurion to me, return this loyal and highly capable and experienced soldier, one of Rome’s few native sons still willing to fight her losing wars. Send him back to me with the substandard, non-Roman replacements you have lowered the standards to force upon us. There is a place for anyone still willing to fight for Rome, substandard or not. We will make good use of them in the fight. Though I will not weaken what remains of the 11th, Rome’s oldest and only undefeated Legion, by making them legionnaires. And we will do what the 11th has done for more than 500 years, we will fight for the future of Rome, for the ideals and principles upon which she was built and has stood this past 1,000 years. Even though we know and accept that unless the collective insanity which has gripped her leaders for generations now is lifted quickly, Rome herself will be no more. We will continue to fight, though, as we’ve discussed before, in the many long years we have served Rome together, I fear the fate of Rome is set, is inevitable and no more than 2 years hence.